Revised after Bolton (2003: 267) - separating Anoplolepis as previously understood into two separate genera Anoplolepis (in Tribe Lasiini; with Zealleyella as a junior synonym) and Tapinolepis (in Tribe Plagiolepidini; with Mesanoplolepis as a junior synonym). Anoplolepis - mandible with 6-9 teeth, when closed not concealed by clypeus; dorsum of head behind clypeus with erect stout setae; eye behind mid-length of head, and anterior arc of torus around eyes posterior to and not touching clypeal margin; ocelli absent (sometimes one median ocellus in largest workers); metatibia with a large distinct apicoventral spur, with a coarse seta on each side; anterior face of gaster without distinct concavity. Tapinolepis - mandible with 5 teeth, when closed mostly concealed by clypeus; dorsum of head behind clypeus without erect stout setae; eyes set variably around midlength of head but anterior arc of torus around eyes touching and slightly indenting clypeal margin; three ocelli distinct; metatibia with a divergent pair of large coarse setae on each side, no median spur; anterior face of gaster with distinct cavity, into which the petiole fits when alitrunk and gaster in horizontal alignment. The genus was originally described as a subgenus of Plagiolepis by Santschi (1914b: 123), raised to genus by Emery (1925b: 16), it appears as a full genus in Bolton (1994, 1995), but was not separated in Bolton (1973a). Most were originally placed in Formica or Plagiolepis. Anoplolepis (Santschi, 1914b) with the meso-metanotal suture obsolete, the metanotum-propodeum suture very feeble; dorsum of propodeum not very convex, not higher or only slightly higher than the mesonotum; head hardly narrower in front than behind; monomorphic, although in some, if not all species, some workers are used as honey-storage vessels and have the abdomen grossly distended. Zealleyella Arnold (1922: 578-9) with the metanotum small, much smaller than the mesonotum, from which it is feebly delimited; propodeum convex and higher than the metanotum; large species often polymorphic. Emery (1925b) separated Tapinolepis as a new subgenus, with eyes placed forward of the midline of the head; a single species from Ethiopia. 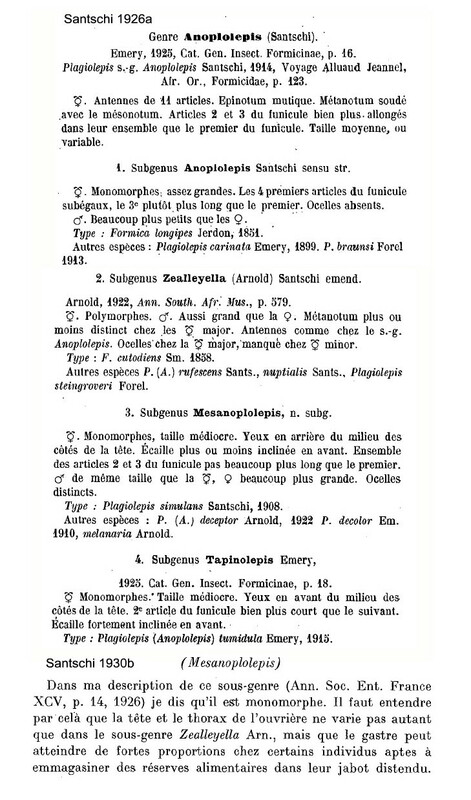 Santschi (1926a) clarified and restated his definitions of the Genus and the subgenera Anoplolepis, Zealleyella, Mesanoplolepis and Tapinolepis. These are at ; together with a note on Mesanoplolepis he added later (1930b - as to the subgenus having repletes but, unlike Zealleyella, not different morphs in terms of head shape. All but one of the Mesanoplolepis species are from eastern Africa, the odd one is from North Africa. Bernard (1952) noted an unlabelled queen from Guinea (among the Mt. Nimba survey collection? 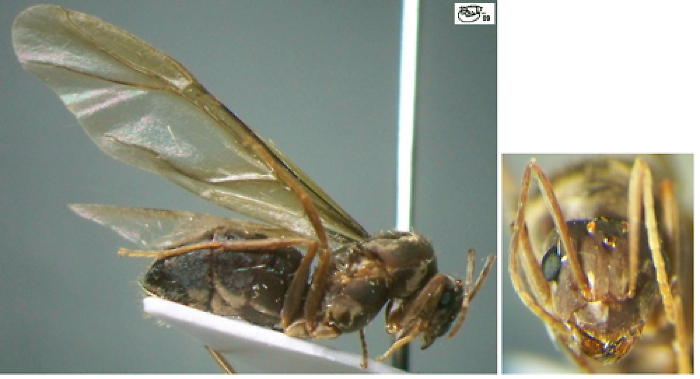 ), probably of the sub-genus Mesanoploplepis Santschi, of which queens were very poorly known. Bolton (1995) listed five species regarded as of this subgenus, all except Anoploplepis simulans (type location Tunisia) have type locations in southern Africa. Also it is only simulans of which the workers, males and queens are known. 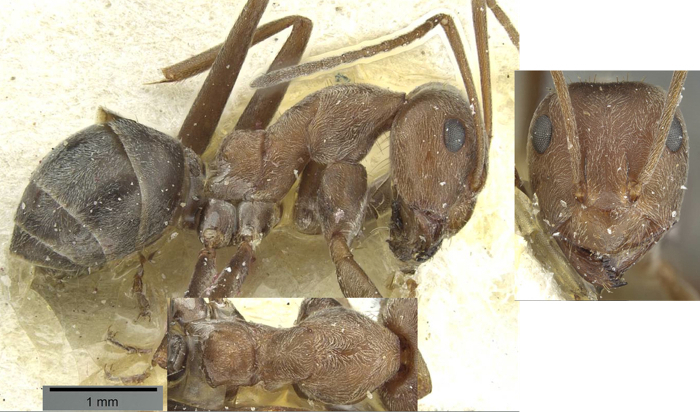 The South African species trimenii is known by workers and queens. Typically, as in others of his generic revisions, Bolton synonymises subgenera and then creates species-groups, in this instance, under Anoplolepis, he wrote of the gracilipes group (being monomorphic) and the custodiens group (polymorphic). 2 TL (major) 9.0-9.5 mm; head large and wide (HW 2.2 mm), rounded and impressed posteriorly; propodeum with the dorsum relatively shallowly convex and less convex and wider than others, declivity near flat, even slightly concave between the spiracles; entire body is sculptured with fine rugosity, densely packed giving a shagreened appearance; mandibles are strongly longitudinally striate; whole body covered in decumbent pubescence, greyish yellow, giving a remarkably silky appearance, on gaster dorsum pubescence forms five evenly separated longitudinal lines, running almost the entirety of the gaster, one forming a median line; strong sparse erect hairs on all parts of the body, more abundant on the posterior of the gaster, the anterior of the clypeus and the mandibles; colour blood red, with a slight brown tint; internal border of mandibles, apex of antenna, frontal carinae, apex of petiole and gaster brown to near black . 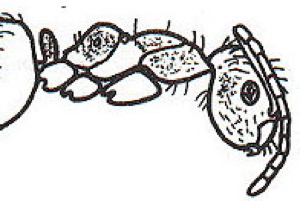 4 TL 3.8-4.2 mm; slender with scapes longer than body; legs also long and slender, posterior pair one-third longer than whole ant; pale erect hairs sparse; colour rufous-testaceous, gaster darker, appendages pale . 5 TL 3.2-3.5 mm; head distinctly narrower anteriorly; mandibles finely striate; dorsum of propodeum rounded, declivity flat, slightly concave basally and twice as long as dorsum, with a distinct angle at junction of dorsum and declivity; head and alitrunk densely and finely punctate, matt; gaster microscopically reticulate, with a silky appearance; rust coloured, pointed, erect hairs quite long on head and gaster; colour testaceous yellow, gaster brown .